Sept 15-21 marks Child Passenger Safety Week. Did you know that car crashes are the leading cause of death for children age 1 through 12 years old? Sponsored by the U.S. Department of Transportation and the National Highway Traffic Safety Administration, the goal of Child Passenger Safety week is to make sure all parents and caregivers are properly securing their children (ages 0-12) in the best car restraint (rear-facing, forward-facing, booster, seat belt) for their age and size. 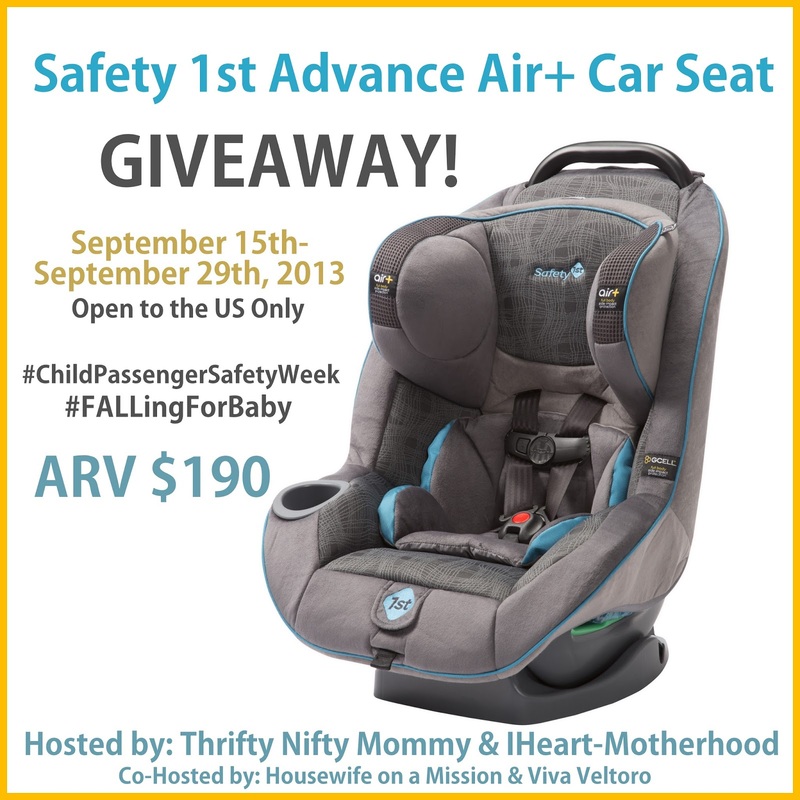 In honor of this important week, I've partnered with Thrifty Nifty Mommy, IHeart-Motherhood, Housewife on a Mission, Viva Veltoro and a handful of other great bloggers to offer our readers a giveaway for a Safety 1st Advance 70 Air+ Car Seat! Product Details (provided by Safety 1st): This convertible car seat was inspired by race car drivers. Air Protect+ combines Safety 1st Air Protect® Technology with GCell HX™ - hexagonal rebounding foam used in the body of the car seat to protect the child from the multiple hits that occur in crashes. Coupled with this is the placement of Air Protect® Technology which takes crash forces away from a child’s head. This technology was developed in partnership with racecar engineers at Bald Spot Sports and INDY Car Driver Scott Dixon to better understand the energy dynamics that a high performance driver faces in the event of a crash. 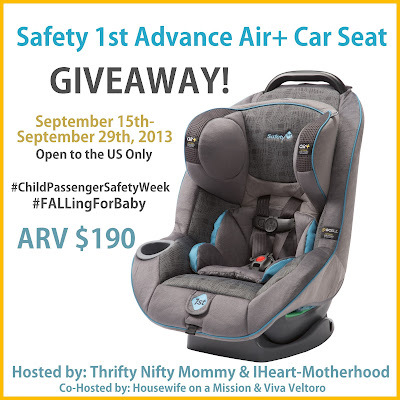 One lucky person will win a Safety 1st Advance 70 Air+ Car Seat, valued at $190! Open to the US only, ages 18 and up. Ends 9/29/13 at 11:59 PM EST. Disclosure: The participating bloggers have not been compensated to host this giveaway. Prize fulfillment is the responsibility of Safety 1st. If you are a business or company and you're interested in being featured in a giveaway like this, please contact Thrifty Nifty Mommy. This giveaway is part of the FALLing for Baby Event. During the month of September, we're featuring lots of amazing baby products! To find more reviews and giveaways in this event, just look for the #FALLingForBaby Hashtag and/or this button! I would really like to win this for my youngest boy because he has been using his oldest brother who is 8 fist car seat so it is really out of date but we cant afford to buy a new one especially for our last child! I want to win for my nephew who only has one of the little booster seats and would like him to be safe with side impact and comfort. I want to win this so that my daughter has a safer car seat. My Daughter Just Got Out Of Her Infant Seat And We Are Using Her Brother Seat. Its Not Expired but it is falling apart! Visited and learned about car seat expiration dates and that a car seat deemed safe more than six years ago may no longer meet federal testing regulations. I want to win this because my daughter is about to grow out of her infant seat, and we could use this one now. I want to win this because my daughter is about to grow out of her infant seat, and we could use this now. It shocks me that so many people have the seats in wrong, that is just scary.